Overview: Since the initial release of Thunderstone , AEG has published expansions for the deck-building dungeon-crawling card game at a feverish pace. (In fact, there have been two more expansions since Dragonspire , the last one I reviewed, but my move last summer put a gap in my coverage.) Now, the game is getting a reboot in Thunderstone Advance , fixing many of the little snags and hiccups in the original. It’s a stand-alone game, but will work with cards from the earlier sets as well. Rating: Superb. AEG took all of the feedback they’ve gotten from a couple years of playing with Thunderstone , and created a new version that is more legible and easier to learn, but retains the feel of the original. Who Will Like It? 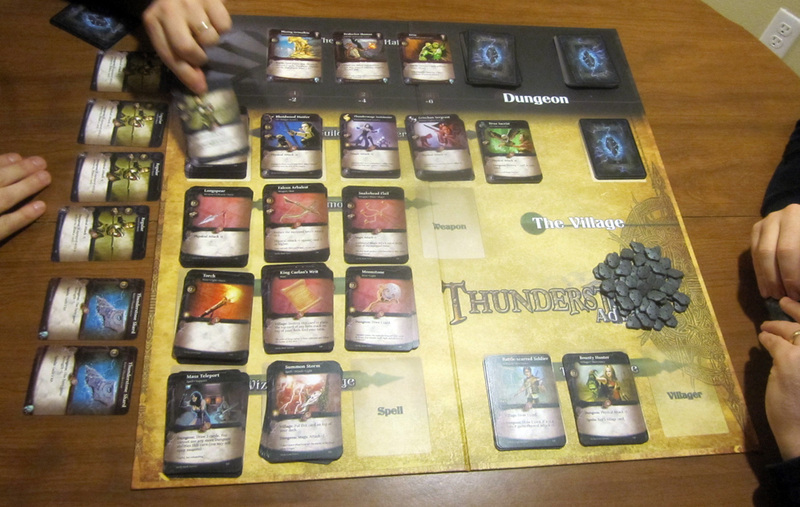 Thunderstone is deck-building meets Dungeons & Dragons , so if you like both of those you’ll probabably enjoy it. Also, if you like Dominion but you want something with deeper strategy and a stronger theme, it’s worth checking out. And it goes without saying that existing Thunderstone fans will have a blast with another new set of cards. One Thunderstone Bearer will be at the bottom of the dungeon — killing it signals the end of the game. The Thunderstone series has always had a little bit of a storyline: an entity called Doom which created the power-filled Thunderstones, and a quest to retrieve them from the deep dungeons where they have been hidden for eons. Our heroes have been seeking out these scattered Thunderstones, hoping to use their power to cast Doom out of their land. The story, however, has been a pretty small part of the game, and you really don’t need much of a plot to play a deck-building game. Thunderstone Advance attempts to make the storyline deeper. Doom was in fact cast out by the last expansion — into another world, which had been at relative peace. Some of the heroes have found themselves transported there as well, and are now leading the charge against new enemies, the Thunderstone bearers. 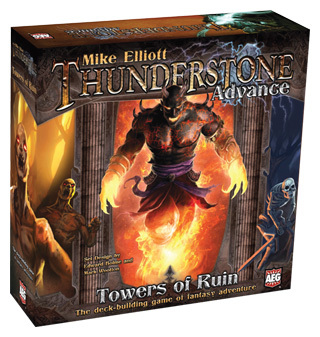 While you can still jump into the game with randomized setups as usual, there are also some themed dungeon setups that correspond to the plot: this first set has three recommended sets for the Towers of Ruin portion of the story, one for each Thunderstone bearer. Personally, I’ve always really loved the Thunderstone game, but I honestly haven’t paid a whole lot of attention to the actual story. The game has a dungeon crawl sensibility to it and that’s really been enough for me. But if you want more story, now you’ve got it. Your starting deck features the Regular, who makes a nice combo with the Longspear. Examples of village cards: weapons, items, spells, and villagers. The cards have a similar layout to the originals, but there are many improvements in the card design to make them easier to understand. The XP number is shown on a little Thunderstone icon that looks like the plastic tokens, and the victory points are on a glowing greenish orb. The price of any given card is still in the same location, in the center, but displayed on a little moneybag. A monster’s health (what you need to attack it) is shown on a shield. In addition, all of the descriptors and keywords have been moved up to the top of the card, right below the card name. So you don’t have to remember which number represents the level of a hero: it just says right at the top “Level 1” and so on. One mistake, though, that didn’t get caught before printing: the hero cards don’t actually say “hero” on them anywhere, but the rulebook makes reference to the label. You’ll just have to identify them by the blue border. The strength number and weapon weights (which are related to each other) are now represented by a little package — it’s the Iron Rations from the original, although it’s kind of ironic because Iron Rations are no longer in the game. In Thunderstone Advance, monster groups are rated by level, to help you adjust for difficulty. Monster groups also have levels now, so that when you’re setting up you can choose to have a harder or easier dungeon. Some cards have additional flavor text, just for fun (and to extend the story). Another nice touch is that you can easily tell what type of card you’re looking at by the border color: heroes are blue, monsters are red, village cards are green, and special cards are brown. Although the blue and green are pretty dark and can be tricky to spot the difference, it’s a whole lot easier than the little tiny icons in the original. Randomizer cards are clearly labeled, and have some details about the items, monsters, and heroes.. The randomizer cards are now clearly labeled on the backs and fronts, and also include a little bit of info about the card, so that you can look at them while setting up and decide if a particular card really doesn’t go well with the others. That extra information helps you fine tun a setup, which can be crucial to a good game of Thunderstone . The board itself is, again, not entirely a necessary thing in a deck-building game. However, there are two things about this board that are pretty handy. First, the two sides represent the Dungeon and the Wilderness. The Dungeon side is the classic game, with three ranks for the monsters and a double attack penalty for darkness. The Wilderness side is a little easier, with four ranks of monsters, and only one light penalty for darkness. (I’ll explain that more later.) The other thing about the board is that it has the village grouped into sections: heroes, weapons, items, spells, and villagers. You won’t fill the entire board (you’ll always have three empty slots) but it prevents a randomized setup from having too many of one type of card and not enough of another. If, for instance, you’ve already got three villagers and you draw another villager randomizer, you just discard it and keep going until you get something else. Again, the board isn’t totally necessary, but is a nice way to keep your village organized and to encourage balanced setups. A nice touch: there are 5 divider cards provided for “Basic Deck,” with the components listed: 6 Regulars, 2 Torches, 2 Longspears and 2 Thunderstone Shards. This lets you keep those starting decks set apart and easily accessible for the next game, and the little reminder on the divider is useful. Finally, AEG has done a much better job with the rulebook, explaining the set up in detail, explaining how cards work, and giving better definitions to things. In addition, they’ve included a “New to Thunderstone ?” quick start guide, which teaches you the basics of the game and walks you through a simplified setup, from basic deck-building mechanics to killing monsters in the dungeon. This is something I wish had been around the first time I played, because it would have made my entry into the game much smoother. In case you’re not already familiar with Thunderstone , I’ll go through the basic gameplay first. If you’ve already played some versions of the game, skip down to “What’s New” for the changes in Thunderstone Advance . Each player gets their own deck, and over the course of the game they will draw cards from this deck. They’ll also each have a discard pile, where they put used cards, cards purchased from the village, monsters slain in the dungeon, and so forth. When a player’s deck runs out, the discard pile is reshuffled to form a new deck. The goal of the game is to have the most victory points, mostly gained through killing monsters or having Level 3 heroes. 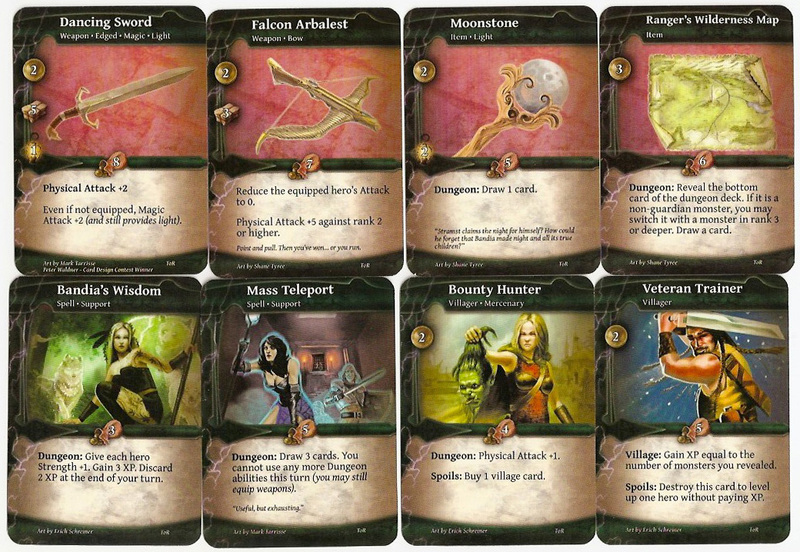 Each player’s starting deck consists of 6 Regulars (Level 0 heroes), 2 Longspears, 2 Torches, and 2 Thunderstone Shards. These cards are shuffled, and each player draws 6 of them to form their starting hand. The village and dungeon are set up as follows: three monster groups are chosen (each group has 10 cards) and shuffled together to form the dungeon deck. One Thunderstone Bearer is shuffled in with the bottom 10 cards of the dungeon deck, and then monsters are drawn from the top of the deck to form the dungeon hall — these are the monsters which can be attacked. The village consists of four types of heroes, the three basic cards (Regular, Longspear, Torch), and eight types of village cards. These are all of the various types of cards you can purchase in the village to help you battle the monsters. On each turn, you choose one of four actions: Village, Dungeon, Prepare, or Rest. If you go to the village, first you can use any “Village” abilities shown on your cards. Then, you count up the gold (the little gold coin icon) on the cards in your hand, and you can purchase one card up to that value, which goes into your discard pile. (You can’t save unused gold.) You can also level up heroes in your hand by paying the XP cost: leveling up a hero makes them more powerful and gives new abilities, but you can only go up one level per turn and only if the next level hero is still available. Then you discard everything you played and from your hand, and draw 6 new cards. Three levels of the Calignite: Lurker, Prowler, Silencer. The Calignite gets a bonus for fighting in the dark. First you can use any “Dungeon” abilities showing on your cards. Then you select a monster to fight. Resolve any Battle effects on that particular monster. Then you add up all of your Attack points on your cards: heroes have some attack, and each hero can be equipped with one weapon, which has additional attack (and possibly other effects). Add up your Total Attack Value, and see if it is equal to or greater than the monster’s health. In addition, you have to take into account the darkness: the farther from the entrance, the darker it is, and the more light you need to have in order to fight. After you’ve determined who wins the fight, resolve the Aftermath effects of that monster. If the monster was undefeated, it goes to the bottom of the dungeon deck. If it was defeated, then it goes in your discard pile. If you won, you get XP tokens equal to the number shown on the bottom left of the card. If the defeated monster or any of your cards give you Spoils effects, then you get to resolve those. Now, discard everything and draw 6 new cards. Place as many cards as you want from your hand on top of your deck. Then discard the rest, and draw 6 cards. This action basically lets you keep some good cards from your hand, throw away the ones you don’t want, and then draw back up to 6. It’s a great action when you don’t quite have what you need to attack, but you think you can get a few more cards that will round out your hand. Destroy 1 card from your hand — that is, you remove it from the game entirely. Discard the rest of your hand, and draw 6 new cards. This action is used to weed out your deck, getting rid of curses or other cards you’ve decided aren’t worth having. However, since it takes an entire turn to do this, you don’t do this if you’re able to do something effective otherwise. The game continues until the Thunderstone Bearer is defeated or escapes the dungeon. Everyone gathers all of their cards (deck, discard pile, and current hand) and counts up their victory points. Highest score wins. “Attack” has been relabeled “Physical Attack” to make it more defined. “React” abilities are new, things that can be triggered at any time. There are now “Battle” effects and “Aftermath” effects — Battle happens before you fight the monster and calculate attack values; Aftermath happens afterward, even if you defeated the monster. “Battle” effects from the original set are treated as Aftermath effects. Instead of ending the game when the Thunderstone reaches rank 1, the game ends when the Thunderstone Bearer is either defeated or escapes the dungeon hall. The Thunderstone Bearer is sort of like the Guardians in the original series: tougher to beat, and with some powerful effects. Treasures, Traps, and Settings are on hold for now, and Thunderstones have been replaced by the bearers. Some of them may be back in the future. The Wilderness side of the board reduces light penalties, making it easier for new players. “Prepare” is a new action in addition to Village, Dungeon, and Rest. You can take any number of cards, put them on top of your deck, and then discard the rest. This lets you stack your deck a little for going to the village or dungeon next turn. Familiars are new: creatures that stay with you and give you advantages. Familiars are creatures that will stay on the table in front of you until you use their effect, and then they get discarded and cycle through the deck until they show up again. You get to draw one familiar card the first time you kill a monster in the dungeon, and that familiar is yours for the rest of the game. The more XP you have, the more powerful abilities your familiar will give you — but you don’t actually spend the XP when you use the ability. One of the biggest improvements is to the basic deck: Regulars replace the old Militia. They still have +1 Physical Attack, but now they only cost 2 XP to level up into a Level 1 hero. Plus, they get a bonus card draw in the dungeon if equipped with a polearm weapon — and the Longspear you start with counts as a polearm. All of this lets you get into the dungeon faster, sometimes even on your first turn, which was nearly unheard of in the original game. One more thing that’s will be available at release is the Avatars mini-expansion. These are a special promo pack that will be available at AEG’s “Level Up” pre-release events around the nation if you pre-order the game at the time, or for $9.99 later. Each player gets a set of avatar cards, choose one for the game secretly, and then everyone reveals them simultaneously. You’ll get to be a Cleric, Fighter, Ranger, Thief, or Wizard, and the avatar gives you a permanent in-play ability for the game. It’s another way to help the player actually be a character in the game, and serves to bring additional abilities to the table. Avatar cards can also be leveled up in the village. When I first reviewed Thunderstone roughly a year and a half ago, I called it “Monsterrific, with some flaws.” Some of those flaws were addressed in later expansions — better divider cards, box design, and XP tokens in place of the cards, for instance. But the biggest complaint that I’d had when teaching the game to new players was the difficulty in parsing the cards: which number is the points again? Wait, what level is this hero? How can you tell? So the most exciting thing to me about Thunderstone Advance is the card redesign. After that is the much more effective Regular-Polearm combo, getting rid of that nearly useless Militia that just took up space in your deck. I do like most of the new changes they’ve introduced, and since it’s all backward-compatible with the old sets, I can just continue adding to my existing collection. AEG has learned a lot through player comments and playtesting, and this certainly shows it. At this point I would say there’s just the one minor flaw in leaving out the word “hero” on the hero cards, but as long as you know blue borders are heroes, that is less of an issue. The trick to this game, apart from some other deck-builders, is that you really have to find the right combinations of cards. To defeat a monster, you have to have heroes, weapons they can use, spells that assist them, and so on. You can’t just throw any six cards together and expect to kill off an Undead Treefolk without suffering some pretty nasty consequences. In some deck-building games you can just pretty much buy whatever, and as long as you have enough money in the deck you can get by. Thunderstone rewards careful planning and weeding out cards you don’t need. The Thunderstone series is easily my favorite deck-builder, and I don’t say that lightly. I’m somebody who usually has trouble picking favorites; my top ten lists usually stretch to twenty or more, and my Best Games of the Year lists are some of the hardest decisions I have to make. I’ll admit that the swords-and-sorcery fantasy theme isn’t for everyone, and that sometimes you get a bad mix of monsters and the game can feel pretty rough, even now. (The Treefolk make me shudder.) And if you like deck-building there are a lot of games to choose from, many of them quite excellent and lots of fun. But for depth of strategy and a strong theme that pulls you into the game, Thunderstone still tops my list, and Thunderstone Advance is a great way to get into it. My advice: if you already know and love Thunderstone , this is a great expansion if only for the better starting deck and the familiars. If, on the other hand, you’ve been on the fence about it, Thunderstone Advance makes it easy to dive in and is a perfect starting point. You can always go back and catch up on the earlier expansions later on if you want. Thunderstone Advance arrives in stores March 12, but watch for those pre-release events the week of March 2. For more about the game, including design notes, head to the official website. Wired: Redesigned cards are much more legible; basic cards have gotten a much-needed overhaul; familiars add abilities that stay with you. Tired: Hero cards aren’t labeled “hero”; still possible to get a rough mix of monsters with a bad shuffle.